Online, Apple, Facebook, and Google are competing to control the future of technology. 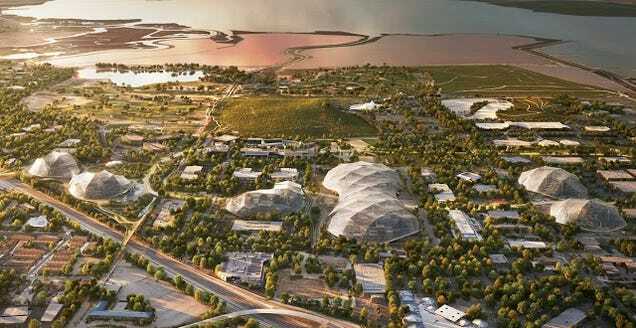 Offline, they are competing to build the future of corporate architecture: small cities nestled in the Silicon Valley suburbs that are designed by some of the most famous architects alive today. It’s a space race. Literally. These buildings are powerful marketing tools. They’re designed to reflect what makes each tech giant unique, and to reflect the work and mission of each. They’re more like branding than architecture: sprawling, glassy developments designed by carefully selected architects that seem closest aligned to each respective company’s identity. Apple has the elegant, stoic Sir Norman Foster. 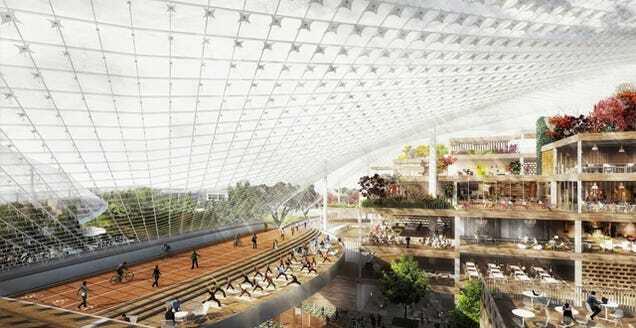 Google has the fun-loving it-boys Bjarke Ingels and Thomas Heatherwick. Facebook? Facebook has the cranky expressionist Frank Gehry. But there’s no such thing as tabula rasa in architecture. Designers learn from their elders, and a bit like your smartphone, every building has a predecessor — including these ones. That’s not to say that these buildings aren’t original (they are). It’s that they’re drawing on an amazing, half-forgotten history of corporate office design that was spurred by IBM, Bell Labs, and many others, decades before the iPhone was a twinkle in Apple’s eye. 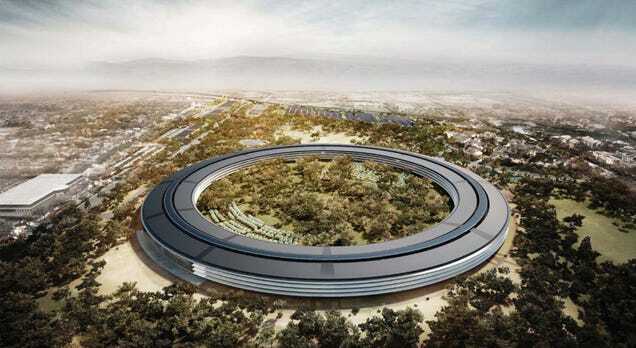 When the British architect Norman Foster unveiled his vast, circular office design for Apple, there was a single word that kept coming up as the world worked to describe it: “spaceship”. They weren’t wrong. This thin, glass-wrapped corridor, which curls into an infinite loop like a snake eating its own tail, feels like an extraterrestrial world. 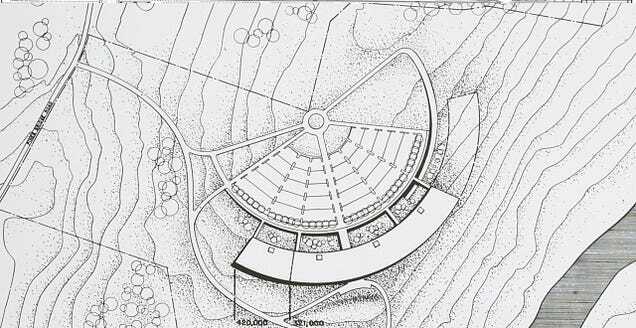 It’s isolated from its environs by acres of trees and green space, and self-sufficient like a spacecraft would be. It’s orientated inwards, towards its own lush garden full of apple orchards and olive trees. 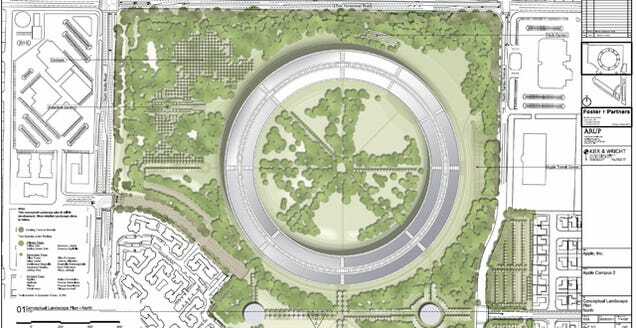 The New Yorker calls it “a private walled garden, costing an estimated five billion dollars”. It even has its own recycled water system. It’s tempting to see the building as an iPod or iPhone: an object practically free of history and precedent that just fell out of the sky one day. 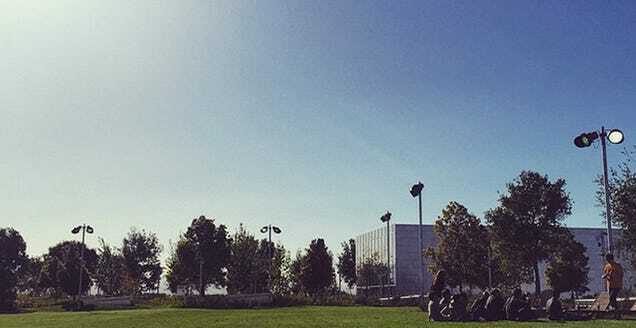 In reality, Foster’s building on the ideas of a Finnish-American architect named Eero Saarinen, who in the 1960s and 70s designed some of the earliest and most important corporate campuses on the planet for clients like IBM and Bell Labs. 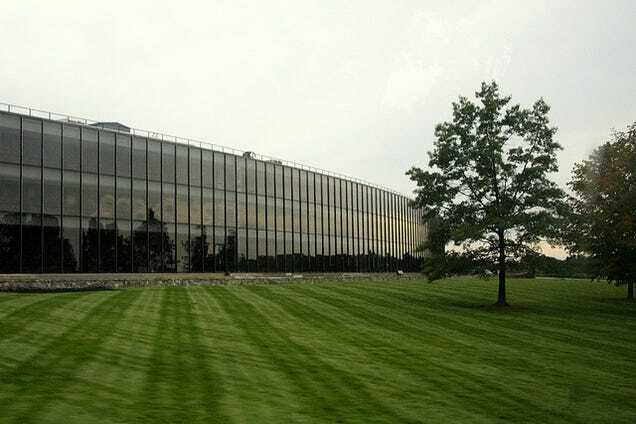 In 1961, IBM commissioned Saarinen to build its Thomas J. Watson Research Center: a secure, relatively inaccessible place where the company could houses its research wing, which at that time was working on everything from supercomputers to theoretical physics. The circular facade wasn’t just for show, either. It was a design feature intended to spur collaboration between the scientists inside by giving them easy access to each others’ offices and labs. “The large curving hallway running along the building serves as a promenade in which IBM scientists and engineers converse and hold discussions at specifically designed alcoves that face out to the forest that lies beyond,” as the American Physical Society Sites puts it. This isn’t actually the first time Foster has appropriated Saarinen’s circle language. “At that time, this was an extraordinary composition!,” writes Hardo Braun in Research And Technology Buildings. 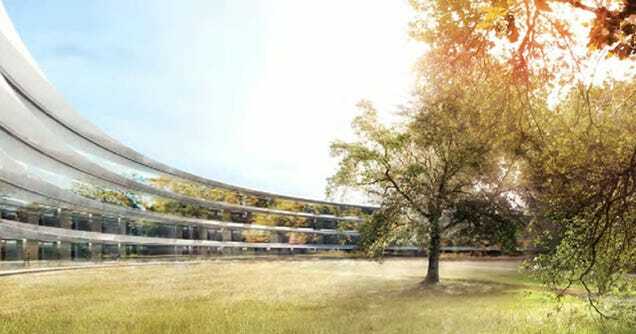 “Just how groundbreaking the scheme really was became apparent 40 years later when Sir Norman Foster adapted it for his McLaren Technology Centre.” And now, in Cupertino, he’s finally completing the circle. 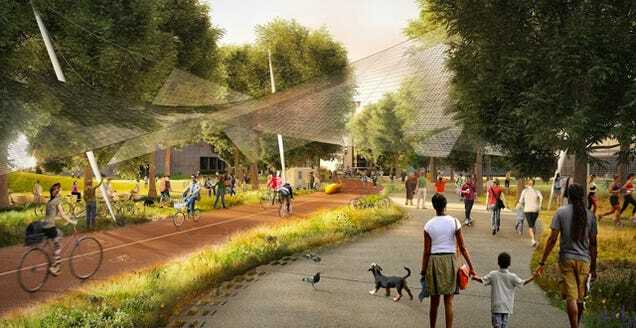 Google actually chose two younger architects to collaborate on its plan: The Danish-born Bjarke Ingels, and the British designer Thomas Heatherwick. 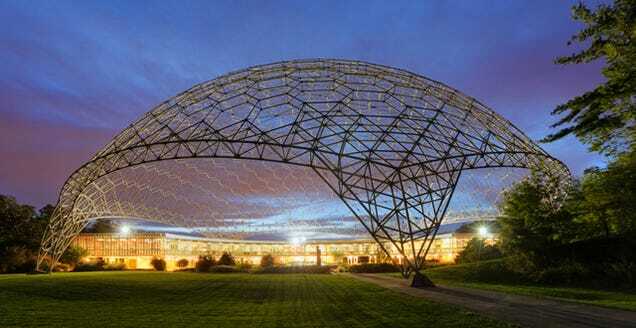 Together, they created a series of lightweight, tensile structures that will blanket dozens of new offices which themselves can be moved and added to as time goes by. 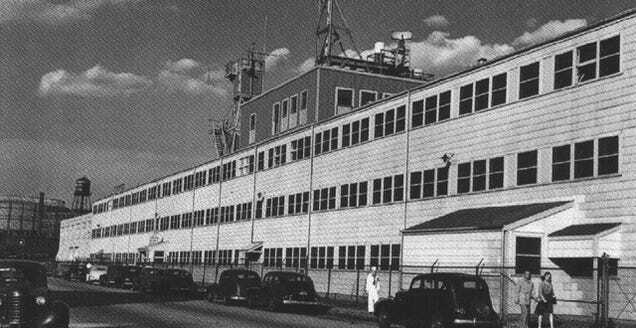 Or you could look at an office on a rural patch of land just south of Lake Erie, Ohio, where in 1959 the American Society for Metals (ASM International) built its world headquarters. 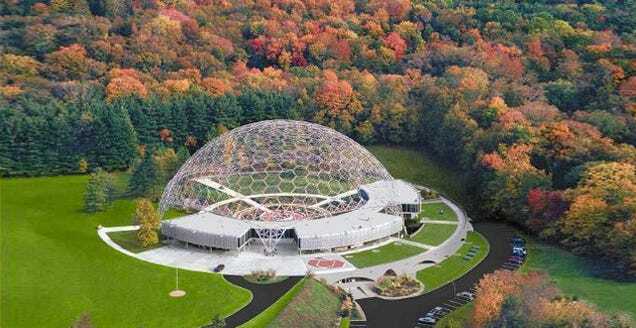 In the 1950s, it decided to build itself a headquarters on a patch of land in Ohio, where an architect named John Terrence Kelly was recruited to build the office. 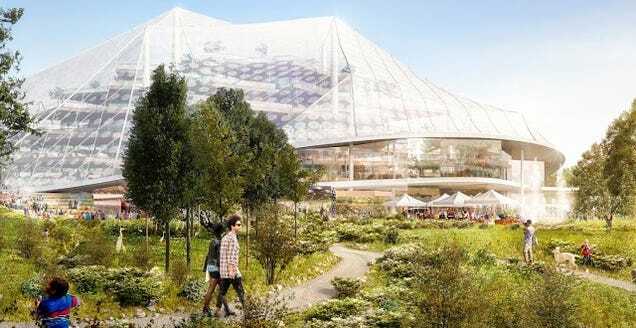 Like Ingels and Heatherwick, Kelly designed an elegant and simple building, but that was hardly the point: he also designed a huge geodesic dome to cap the structure, whose tens of thousands of distinct pieces create a half-indoor, half-outdoor space. 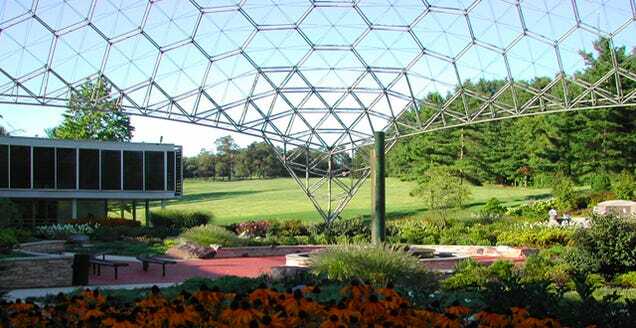 At AMS’s headquarters, engineers could debate and discuss the questions of their day in nature, around a “mineral garden” displaying all manner of metals and ore, protected by Fuller’s dome. 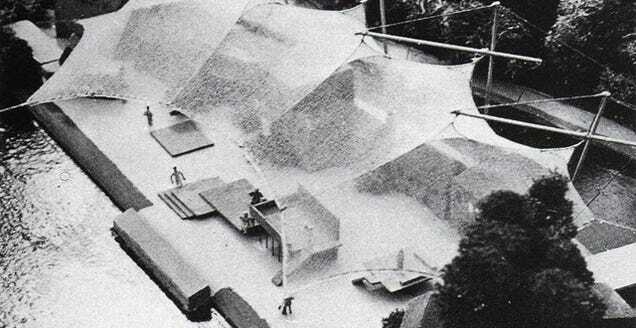 Gehry himself insisted that it’s “not a grand design statement.” Zuck, he said, “wanted a space that was unassuming, matter-of-fact and cost effective. 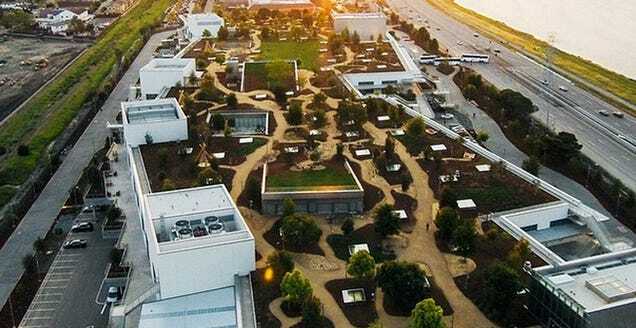 He did not want it overly designed.” The idea is to distance Facebook from the wildly expensive and precious architecture of its competitors; this is an office, not art, they think. You can find the same idea all over the place. Look all the way back to the RAND Corporation, which grew out of several World War II defence departments to lead the information revolution in the 1950s. 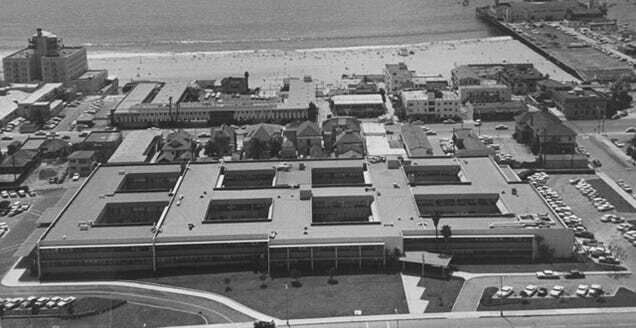 RAND designed its own simple headquarters in Santa Monica based on the same theory. The critic and architect Michael Kubo wrote a thesis and book about the building called Constructing The Cold War Environment: The Strategic Architecture of RAND. The book’s description says, by way of introduction, that the building was “designed (based on a memorandum written by a RAND mathematician) as a redundant matrix of corridors to maximise chance interactions among researchers and promote creative thinking.” Essentially, it’s randomness generated by maths – engineered to engage human inhabitants, just like Facebook’s new office. Since then, Building 20 has become a kind of swan-song among architects — recreating its mixture of randomness and necessity that seemed to result in such remarkable innovation. 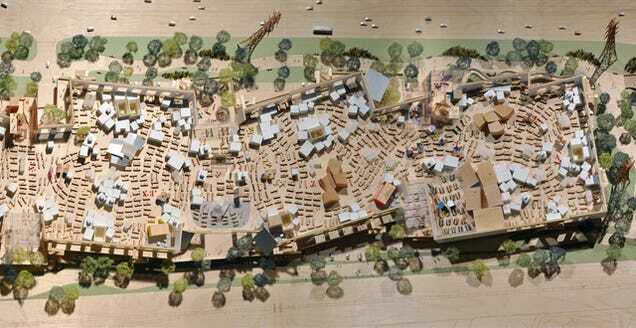 Facebook and Gehry are reappropriating the idea in Menlo Park. But of course, they’re throwing some nice perks in, like art from legendary graffiti artists and a bonkers roof deck. The bones of the idea are all there, though. In the end, each of these offices is the unique product of the company paying for it. But it’s fascinating to see how threads of each plan reach all the way back to the 1950s and '60s. There’s something kind of poetic about the fact that the first wave of buildings were built to house engineers and scientists whose work directly contributed to the creation of mobile phones, computers, and the internet itself. Now, their work—and the offices that housed it—is being put to use by a new generation of engineers and architects. 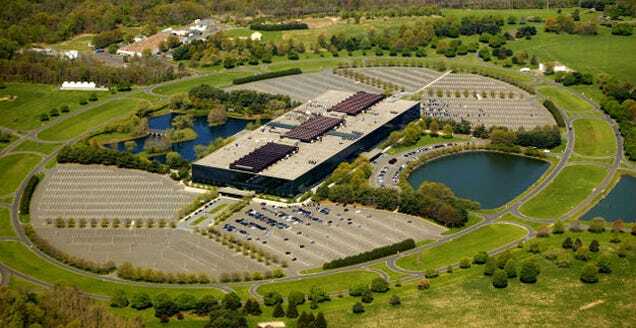 Will Facebook, Apple, and Google have the same impact that IBM or Bell Labs did?